Nadler’s warning came in response to a CNN claim based on unnamed sources that White House lawyers plan to review the report before Attorney General William Barr sends it to Congress. The review would be to identify passages to be excised under executive privilege. The phrase “executive privilege” is not in the Constitution, but every president has claimed it as an inherent right of the office. A 1974 Supreme Court decision forcing President Richard Nixon to release the Watergate tapes was the first time the high court officially defined the parameters of executive privilege. In the present case, the debate centers around this question: Does Trump have the right to review any executive branch document—including a special counsel’s report—prior to its release to Congress or the public or is he excluded from such a review by the law, which specifies a special counsel report goes to the attorney general, who then decides whether to show it the president or Congress? 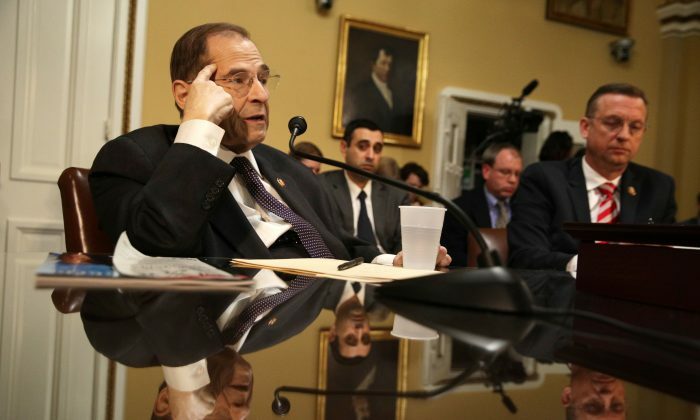 “Chairman Nadler is right to push back on the White House claim of executive privilege and the possibility that it would request redactions from the special counsel’s report,” Scott Amey, general counsel of the Project on Government Oversight (POGO) told The Epoch Times. “The White House has the burden to explain its privilege claim, prove that the president personally invoked it, and prove that it wasn’t waived. Unless something was discussed or placed in writing at the time, any claim of privilege might be too late,” said Amey, who has been with POGO since 2003. Others see a totally different situation regarding the special counsel and Trump’s right as the head of the executive branch to review the report. Judicial Watch is a non-profit government watchdog that has used the Freedom of Information Act (FOIA) to force the release of hundreds of documents related to the Mueller investigation and the events that led up to it. “There’s this notion that has crept in, and of course the Justice Department bureaucrats and the FBI bureaucracy have been happy to let it solidify, that somehow these agencies are separate and apart from the executive branch and that they are their own fourth branch,” Fitton said.